Learn about emotional targeting, a conversion optimization expert's approach to increasing conversions, and how it can help you learn even more about your audience and what they want from your business. 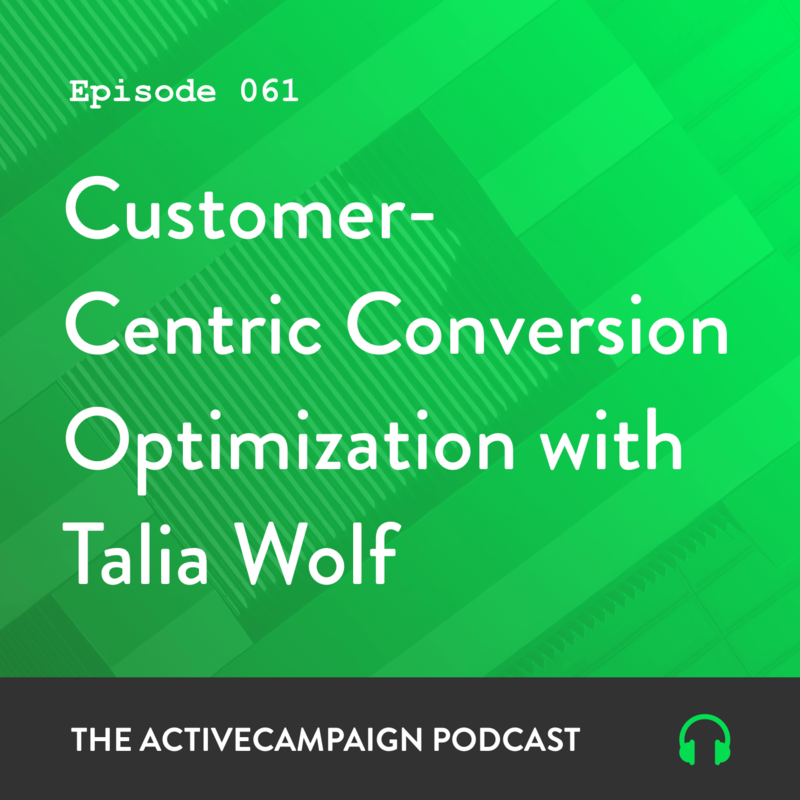 Conversion optimization expert Talia Wolf shares why emotional targeting is key to optimizing a sales funnel, and how she uses it to create more customers for her clients. Listen in to learn how to discover what motivates your customers, what their concerns are, and how to build a website that appeals to those emotional drives. Talia Wolf is a conversion optimization specialist who runs workshops, provides an online course, and offers optimization services to her clients through her conversion company, GetUplift. Find her on Twitter @taliagw. Chris Davis: Welcome to another episode of the ActiveCampaign podcast. I’m your host, Chris Davis. I have [00:00:30] with me on this episode Talia Wolf of GetUplift.co. Talia is a customer-centered conversion optimization specialist. That’s the long version of saying she focuses on creating more customers by emotional targeting. You will know what all of that means at the end of this podcast, and I just want to give you a heads up. Talia is [00:01:00] going to outline her framework to optimizing a website, the things that she looks at, and how to make a website to where it appeals to the emotional state of your audience, your visitor, to ensure that they are a highly converting customer, or turn into a highly converting customer. All of that in this episode. Sit back, listen, enjoy. Talia, welcome to the podcast. Glad to have you on. How are you doing? Talia Wolf: [00:01:30] Great. Thank you for having me. I’m excited. Chris Davis: Yes, yes. That definitely makes two of us. I’m really excited to talk about conversions and the approach and just, your unique approach to it. Before I get ahead of myself, tell us a little bit about your background, who you are, how you’ve got to where you are? Talia Wolf: Sure. I’ve been in marketing many years. I started out with social media marketing. I worked in an agency, I was doing [00:02:00] ads, campaigns, building Facebook pages and stuff like that. I was always intrigued by how to turn that traffic, that engagement into ROI, into actual revenue and leads and money. My clients, they weren’t so much, I have to say, they were more about likes and comments. I took it upon [00:02:30] myself to test stuff without really knowing what I was doing. I was just changing headlines and call-to-action buttons and stuff like that. I didn’t get the results that I wanted. I just started researching and reading and reading, and suddenly, I discovered that what I was doing was something called conversion optimization. Hey, there’s a field that doesn’t deal with traffic and just optimization. That’s [00:03:00] kind of how I got sucked into it and started my own agency with two partners. Talia Wolf: Yeah. We ran that for five years, and then we sold the agency, built a startup company, a product for mobile optimization, and then very quickly I realized that’s not where I want to be. I really want to go back to conversion optimization and optimizing stuff. [00:03:30] So I built my own consulting company, and I’ve been doing that for a year and a half now, with my own brand, GetUplift, teaching, doing a lot of workshops, I have an online course, and working on optimizing stuff for my clients basically. Chris Davis: Yeah. Wow. Where would you say, was there a point, there an event, is there a particular time that [00:04:00] you can identify or pinpoint when you were doing your social media marketing to where you did make that shift from just likes and followers and the vanity metrics to actual ROI? Talia Wolf: I think it was when I got a charity company as a client. I was working in-house for a very great agency, they [00:04:30] were doing amazing work, and this was a charity, and I realized that we should be doing more. That it’s great, that we’re getting the conversation going and that we’re on Twitter and we’re on Facebook and we’re doing stuff, but I wanted to get donations. I wanted to make a difference and not just be the sidekick that gets told that, okay, now we should post this or post that, or do [00:05:00] some sort of Facebook contest. I really wanted to be able to sit there in front of my client and say, “Hey, we raised X amount of money,” or, “Thanks to this part, we were able to complete the whole funnel,” or whatever it was. Chris Davis: Yeah. Wow. That’s great, because I remember, I can only imagine, you said you were building Facebook pages. That kind of dates back to just how long you’ve been doing it. I remember, [00:05:30] Talia, at that time, it was all about the likes, and nobody was really thinking beyond that. Everybody was judging other pages, “Oh my god, 12,000 likes, how did you do it? A million likes, you’re official!” It was a select few, a select few of people behind the scenes that knew that those likes did not translate into dollars automatically. Chris Davis: Yeah, yeah. It’s important, right, because that’s the benefit that digital gives us. Digital gives us that insight to see exactly how something is [00:07:00] performing. You’re exactly right. You see it across the board. I think it comes from really a lack of understanding of marketing, even traditionally before the digital age, a lot of people didn’t know how to market. You would see another business in the yellow pages and you would say, “I need to put a yellow pages ad in,” right, and just blindly do these things, because it was like, okay, hopefully if I do this, people will come, leads will be generated, money will be made. That really [00:07:30] comes to hurt you in the digital age, because you spend a lot, you can waste a lot of money. There’s no shortage of agencies ready to charge you $30,000 for a website that doesn’t convert, no shortage of consultants that can build out a funnel that worked for someone else and is not working for you, no shortage of copywriters that will write copy that converted somewhere else, but isn’t converting for you. It can get very expensive [00:08:00] very quickly. Talia Wolf: I agree. I’m actually really excited that you said all of that just now, because it just leads in so well to my framework and the method and the way that I optimize websites, because that is exactly what led me to change everything I was doing with optimization, I’m sure we’ll get into this soon, but when I started out with optimization, I was following certain tactics, I was following best practices, someone else’s, I was reading blogs, I was listening [00:08:30] to random opinions, and I would get no results. If I did get results, it would be nothing that I could scale would do it. I would be basically testing elements and tinkering with the website, like changing a call-to-action button in their headline, and it got me nowhere. It’s only when I understood … what I understand today is that everything changed for me, and I was able to build a framework that not just optimized [00:09:00] a KPI, it didn’t just get more downloads, but it optimized the entire funnel and the entire business. Chris Davis: That’s good. In fact, that’s so good, I can’t wait, Talia. Let’s jump right into the framework. Tell us about your approach to your framework here? Talia Wolf: Yeah. As I mentioned, I used to, I like to say tinker with the website. Just play around with the elements on the website, because that’s what people are doing. I [00:09:30] really did feel frustrated, because I wasn’t getting the results that I wanted for my clients, and I felt like this doesn’t make any sense. I went back to, let’s say my bat cave, and I started thinking about what conversion optimization really is. I realized that optimization isn’t about getting an increasing KPI, or it isn’t about changing elements on your websites, [00:10:00] it’s about solving people’s problems. What I mean by that is, the root of every conversion in life is a decision making process. If you can understand why people make decisions in life, it will be easier for you to build a funnel for them. If you know why they make decisions, you will know exactly what copy to put in there, what visuals, what colors, what images, what social proof you need on your page, because you know what [00:10:30] motivates them, you know what changes the way they think, or you know how to persuade them. The thing about decision making is that we are all irrational beings. I know we love to think of ourselves as rational people, but in fact, every decision we make in life is based on emotion. Every decision. When we buy something, we’re essentially buying a better version of ourselves, a better marketer, a better father, [00:11:00] higher self-esteem, I want to look good for someone else, whatever it is, when I buy something, whatever I buy, what I care about isn’t the what, it’s the why. It’s the value behind that. I understood that if I could figure out what are those emotional drivers of a customer, what are their hesitations, what are their concerns, what are they worried about, what would make their day, what are they feeling [00:11:30] right now, what is the pain that they feel right now when they’re on the page, and how would they love to feel if they found the right solution for them? If I can identify those, then it’s so much easier for me to optimize the page, because I’ll look at a landing page, I’ll go into Google Analytics, and I’ll see the data, and I’ll discover that there’s a problem with the landing page, or I’ll see that there’s a problem on the pricing page or in the checkout page. That’s great, but that’s only where you find the problem. [00:12:00] It doesn’t help you actually optimize it. When you find a leak in the funnel, how do you know what to optimize, what to change, what changes to make on that page that will actually lead to a higher conversion? Data is cool and it’s great, and you should be data-informed, and that’s why I really don’t like it when people tell you to be data-driven. I say customer driven. Know the data, understand the numbers, but then go deeper and understand [00:12:30] those emotional drivers of your customers, their baggage, the underlying things they come with to your website. Then if you know that, if you know the pain, what their biggest fantasy is and what they want to become, it’s easier for you to create that experience. You’ll know exactly what copy to use, what headline, what call-to-action button, what psychological colors, what cognitive biases and more. Chris Davis: Wow. I mean … [00:13:00] it really takes the spotlight off of you. Here’s my company and my website. Here’s what I can do, and look what I can do, all of that. When you start to focus on making your visitors, understanding that your visitors want to become a better version of themselves. When that is the target and you start taking into account, like you said, all of the psychological triggers, their behavior and all of that, it totally changes [00:13:30] how you position your website. Chris Davis: You said so much, Talia. Keep going. Keep going. Talia Wolf: You know what, the first pillar of emotional targeting is make it about the customer. You are not the hero of the story. The funny thing is that when marketers and businesses look at websites, the first question I always ask my clients or my students is why do people buy from you. As you said, the first thing people [00:14:00] talk about is themselves. “We have this and this product, and these are our beautiful features. We have the best pricing in the business, and we’ve got these deals and that deals, and our support is great,” but that’s all about them. That’s nothing about the client, nothing about the customer. That’s why I love Bryan Eisenberg’s quote, where he says, “When your customers achieve their goals, you will achieve your own.” You need to stop talking about yourself. You [00:14:30] need to talk about your customer. You need to understand them and show them on the page. No one cares about your features or your pricing, not at first. What they want to do, when they land on your website, when they land on your landing page or when they open your email, they want to see that you know them, that you understand them, that you have gone through that pain and that you’re there to solve it for them, not for yourself. Chris Davis: Yeah. I had a vision while you were talking, [00:15:00] and it’s like, a person walking, and whatever version of them, let’s take someone who wanted to be more muscular, right, and they’re walking, and they walk in front of this mirror, and when they look in that mirror, they don’t see them, they see the more muscular version of themselves. Chris Davis: It’s like, that’s the experience that should be communicated via your website. The visitor comes to your website as Clark Kent, but they leave as Superman, right? Talia Wolf: Yes. [00:15:30] Brilliant. I’m going to steal that. That is gold. Yes. Chris Davis: Wow. You mentioned emotional targeting. Now, full disclosure, before we recorded this podcast, we talked, I had time to look it up and really figure out what you meant, but in the beginning when you first came across my docket of hey, reach out [00:16:00] and get on the podcast, I was like, “Oh, emotional targeting? What is that?” Take a little bit, and I know you have a course on it as well, but talk to us about emotional targeting, because I hadn’t seen that word, that terminology used until I came across you. Talia Wolf: That’s funny, because everyone talks about behavioral targeting. That’s actually where it came from, when the world keeps going towards automation, the world keeps going towards data. [00:16:30] Businesses see their customers as browsers, devices, geographical locations, gender. That’s what we look at. We forget that when someone comes to your website, they have a challenge. They have a problem, and they’re looking at you to solve it. It doesn’t matter what it is, if they’re looking for something to wear that night or if they’re looking to solve a problem within their business. When they come to your website, [00:17:00] they need you, they’re looking for you. The idea of emotional targeting, what stands behind it is a process of identifying those emotional drivers. Before, I said this is what you should be doing, this is important, you should stop talking about yourself. You should start understanding those emotional drivers. You should then use the power of color psychology, of images, of copy and so many other elements, and social proof in order to [00:17:30] speak to your customer’s emotions, but you have to figure those out first. That’s what emotional targeting is about. It’s about targeting those emotions. We go, and through the course we do this too, we go through a process of identifying the emotions that drive your customers most to say yes. What are those emotions? What are they looking for? What are they worried about? [00:18:00] Then we’re able to take the next say, and then say, okay, if these are the emotions that people are feeling right now, these are the emotions people want to feel. If we’re talking about B2B it’s the same. Right now, you have a communicational problem [00:19:00] within your distributed company. Right now, you’re feeling frustrated, you’re annoyed. Things are falling, you’re not really sure who’s doing what, and it’s hard to get on the call. That’s one version of it. The other version of it is everyone’s best friends, you’re talking to everyone every day, you know what’s coming, what’s going, what’s happened, everyone’s accountable for their stuff, and the now versus the future. Emotional targeting is about understanding those emotions, [00:19:30] the now and what they want, what they’re feeling right now and what they want to feel, and then showing them on the page in order to increase conversions. Chris Davis: Wow. Wow. As you mentioned, it’s done in many ways. It’s the colors that you use, the images. You can even go to the actual layout, layout of the page. I would imagine if they were in distress, like maybe this was a … in the relationship vein, we’ll stay [00:20:00] in that example, maybe divorced or somebody stressed and lonely. You probably don’t want a really long page filled with text that somebody who’s lonely is probably not going to read, because they want immediate relief. They want something to make them feel good now. If they land on your page and maybe your colors are black and so morbid and browns, it’s just like, [00:20:30] they’ll just leave it. Then they may find themselves on a page with lighter colors, pictures of people smiling, having fun, or somebody by themselves, but actually being consoled. Am I getting the emotional targeting right? Talia Wolf: It’s the direction. I think one of the best things that we do with emotional targeting is called identifying the stages of awareness of your customer. You [00:21:00] mentioned someone who’s divorced who might be stressed, maybe they have kids, maybe they don’t, maybe they’re worried that they’ll never find someone. If it’s a woman, she might feel whole different types of emotions than a guy, right, who’s divorced. Then your goal is to identify what stage of awareness are they. Are they aware that they have a problem? Are they unaware? Are they actively looking for solutions? [00:21:30] Did they happen to stumble on your website? Identifying that, there’s five stages of awareness, I won’t get into them because it’s quite long, but just by identifying the stages of awareness of your customer, you can choose as you said the right color, the right images that you want to have on the page, the social proof, which is so immensely important, what are people worried about. You mentioned someone’s stressed. Maybe with your social proof, [00:22:00] you shouldn’t have someone young and cool who’s just dating for the first time saying, “Wow, this is the best dating app in the world.” You want to have someone who’s divorced who actually says, “I was really worried at first because I was divorced, but now I’ve found someone.” It’s a difference between knowing who your target audience is. It’s not treating them all the same, but an understanding that the people that are coming to your page are specifically feeling this and this pain, or they’re concerned about XYZ. This doesn’t mean you have to create a [00:22:30] different page for each type of customer. It just means that you need to address everything in different points of the page. Chris Davis: Yeah. This is why expert copy doesn’t work for everyone. That person has dug deep. They’ve done the work. They’ve done the research for their audience. There you go copy and paste, because it looks good, it reads well, and it resonates with you, and perhaps you even serve the same audience, so you think from a cursory [00:23:00] glance it looks like the same audience, a lot of overlap. You take that copy, put it on your page, and you get crickets. It’s because they’ve done exactly what you’re saying. They’ve dug deep. They understand exactly where their audience is emotionally, where their desires, where they desire to be, their ambitions, all of those. They wrote specific to that demographic. Talia Wolf: Exactly. You know, when I [00:23:30] think about, it really is about understanding your audience. I’m always, I always say that I’m against competitor research, because I feel like it’s the blind leading the blind. Most people don’t really invest in research, and we just copy from each other. However, the only thing that I really recommend when I look at competitors, and I think this is a goldmine that anyone, you don’t have to have a budget, you don’t have anything, if you’re listening to this right now and you only take one thing from this podcast today, I want you to do [00:24:00] this. Go on to your competitor’s websites, and look for the reviews that they’re getting. Look for the social proof. Start copy and pasting that into an Excel file. Start seeing, what are the hesitations that they’re mentioning, what are their concerns and the reviews, what are the things that annoy them, what are the things that they’re really happy about? All these things are said by people who should be buying from you, and are currently buying from your competitor. Now, if [00:24:30] you can identify the wide range of things, and it usually isn’t, it’s usually two or three points that keep coming back in these reviews, it’s easier with eCommerce, but it works with everyone, you can go onto specific rating sites, review sites, and see what people, even on Yelp or Amazon, see what people are saying. What are their complaints, what they care about. This will, A, tell you exactly what you need to tackle in your next email or on your homepage or on your landing page, what social proof you should be reaching out. [00:25:00] If you see that everyone’s complaining about one thing, go to your customer or your client that you know experienced that before and ask them how you solve that for them. Put that on the homepage. That is your social proof. Not a random praise about how amazing your company is, but solving that specific issue. You do that, the other thing that is really cool about that is that you get copy, raw copy. You don’t need to make up the words. Your customers, your prospects, are giving them to you, so use their words. That is [00:25:30] a headline for you or bullet points or whatever it is on your page. Chris Davis: Great. It’s digging deep. It’s digging deep and exposing what you find when you dig deep, right? Talia Wolf: Mm-hmm (affirmative). Exactly. Chris Davis: You dug deep and found those triggers, now expose them. Put those as headlines. Talk about them effectively. In closing, Talia, you are an expert. Customer-centered conversion optimization, that is your space. What can you tell our listeners, what is [00:26:00] the benefit? When it’s done right, what can they anticipate reaping? What results can they anticipate experiencing? Talia Wolf: Great question. Obviously, you’re going to see a lot more conversions. I’m talking, like, 10 times the conversions that you’re seeing right now, because your entire strategy changes. I want to say that more importantly, what you’re going to notice is two amazing things. One, higher retention [00:26:30] rates. Because you resonate with your customers, obviously today you’re converting, people are converting, but they’re converting, and they might not resonate with you right now, you might not be resonating with these people. When you resonate with them from the top part of the funnel, they’re going to stay on for longer. You’re going to get lifetime customers and clients. That is amazing. Now everyone in the company is shifting [00:27:30] towards being customer-centric, delivering the message that your customer actually wants to hear. That means more sales, better support, higher retention rates, and if you’re in eCommerce, you could even change the way you’re shipping stuff because you know what people are expecting. The knowledge that you gain from this kind of work is not just, I got more downloads. I got more sign-ups. It’s knowledge that you can give everyone in the company and everyone [00:28:00] can align to it. Everyone’s in the same place, there’s no more silos, and then we’re speaking the same language, the customer’s language. That to me is bigger than getting 10 times conversions or double the conversions or whatever it is. [00:29:00] I love everything that you laid out. If someone is struggling with conversions and they know it, or they’re not aware of it, what would you say is a good starting point for them? I know you mentioned Google Analytics earlier, and internally I was shouting, like, “Yes, look at the data! Look at what people are … look at their behavior,” you know, start there and build out. What would you give somebody, just some quick advice, if they’re listening, they heard everything [00:29:30] you said. They’re like, “Yes, I want to be better, I want to optimize more.” What is a good starting point for them? Talia Wolf: There’s definitely a few ways. Obviously, number one is going to be look at Google Analytics. If you’re not doing that yet, you want to identify your prospect behavior. What are people doing on your website? You can also use heat maps, which is a great way to identify what people are actually doing on the website, where are they clicking, how much are they scrolling, what are they reading. [00:30:00] Maybe even more important, if you do one thing, it is customer surveys. Put together a survey and ask people the important questions. Not if they liked your website, not if they liked your product. Ask them what pain are they trying to solve, what lead them to your website today, why are they here, and collect that data. Collect it, because that [00:30:30] is worth everything. Actually just today, I tweeted that I finally finished analyzing, and I’m not kidding, 2,000 responds for a survey manually for a client. Talia Wolf: I haven’t even looked at the Google Analytics data yet. I have a ton of work in front of me. That was the first thing I did, and man, did I learn a lot. Wow. Wow, wow, wow. I know the exact three things that need to happen strategically on the website right now, [00:31:00] the things that we need to say, the things that we need to remove ASAP, and the things that need optimizing. That’s before I’ve even gone into Google Analytics to find the leaks. I’m going to do that obviously, but this data is also important. Chris Davis: That’s powerful, Talia. That is truly powerful. Thank you, thank you for sharing, and thank you for being on the podcast. I really enjoyed this one. How can people find out more about you, follow you, get connected with [00:31:30] you? Talia Wolf: You can follow me on Twitter, which is @TaliaGW. You can read all our blog posts, which are basically very in-depth guides with a lot of templates and frameworks that you can download on my website, GetUplift.co. Chris Davis: GetUplift.co, great. We’ll have all the links in the show notes. Talia, I can’t express how much gratitude I have for you for coming on, taking some [00:32:00] time, and giving our audience some insight, some advanced insight on your approach to optimization. It’s been really great. Talia Wolf: Thank you so much for having me. Chris Davis: Yes. No problem. I’ll see you online. Thank you for listening to this episode of ActiveCampaign podcast. I hope that it’s a lot more clear the importance of conversions, and your approach, your specific [00:32:30] approach to getting conversions by digging deep with your audience, identifying those pains, those needs, those aspirations, and helping them see a better version of themselves when they come to your website or when they interact with any of your marketing material. ActiveCampaign, we’ve got the checkbox on the behavioral tracking that, helping you understand what they’re doing. You can take all of that data [00:33:00] to understand their interests, but don’t stop there. Dig deep with your audience and find out some of those emotional triggers and optimize the customer experience with that data. If this is your first time listening to the podcast, I want to invite you to become a subscriber of the ActiveCampaign podcast. We’re on iTunes, Stitcher, radio, Google Play, SoundCloud, everywhere that you can access a podcasting application on your mobile [00:33:30] phone or on desktop. We’re there, just search for the ActiveCampaign podcast. When you’re doing so, please leave a five-star rating. Leave a five-star rating to show everybody, remember, we talked about social proof in this podcast, give some social proof. If you want to take it to the next level, leave us a review. It would be greatly appreciated personally by me, but as a company, it will help us get the word out. If you’re an ActiveCampaign user and want to get more out of the application in terms of tracking behavior, [00:34:00] understanding what people are doing, maybe you need help tying in your website activity with ActiveCampaign and Google Analytics and really understanding that story, ActiveCampaign.com/Training. You can sign up for a one-on-one and talk to one of our success team members in person specifically about that. Do not stay stuck at ActiveCampaign. We’ve got too many resources. We’ve got too many people ready and willing [00:34:30] to help you on your journey. If you want to take the more self-guided approach, we have the education center where we have guides, podcasts like this, videos, webinars. You can learn at your pace, however you prefer. We’re here to help you provide not only a great tool, but service powered by humans. We love automation, but we are a company where you can speak to human beings and get the help that you want. This is the ActiveCampaign podcast, a small [00:35:00] business podcast to help you scale and propel your business with automation. I’ll see you on the next episode.